Andre Extra Strength Hair Remover cream is made to take off even the most stubborn body hair to leave you smooth, sleek and sculptured. At last, there is a hair remover cream that is strong enough to remove tough male body hair. Whether you are a serious sportsman wanting that split-second advantage. A body builder needing that muscle definition, or simply like that lean, sleek finish of a hairless body. Andre is the answer. With Andre Extra Strength Hair Remover you will never have to worry about razor rash or ingrown hairs from waxing again. 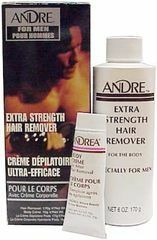 Andre Extra Strength Hair Remover is the fastest, gentlest way to bare up all year long. The business owners here at Lacies have just tried it left the cream on for 5 minutes and it removed everything all the hair !!! No red marks or anything. Contents: Includes 6 oz (170 grams) Hair Remover and 1/2 oz (15 grams) Body Creme.